Come, taste, and see that I am good…. The little things we use to do for you girls…the little notes, the little gifts of love tucked away in your suitcases and backpacks…you’re now doing for us. Tears have washed over my heart today…just knowing what beauty we have with our kids…Thank you. We’ll miss you…but we’re excited! We’re awed and humbled that we even get to think of doing something like this. lies a small and pleading voice. Yesterday morning I spent some time with God. I spent some time thanking him for various things, but then just kind of shared with Him that I’m hungry for MORE with Him. I’m so grateful for His Word, and love when he shares wisdom with me either through it, or personally and in the moment. But yesterday, a different hunger had risen up…a hunger to CONNECT with Him more…to have that again refreshed. Well…in the evening, after being sick all day (that’s the mysterious part), I was reading a new Lori Wick novel, and read a short passage that made me lay down my book as tears suprisingly came to my eyes. Unusual. They kept coming, and with them came up out of me emotions and thoughts I’d been praying about for some time….deeply….but had not allowed myself to really FEEL deeply with Him. Trust God from the bottom of your heart. Don’t try to figure out everything on your own. Listen for God’s voice in everything you do, everywhere you go. (Proverbs 3:5 NLT) In order to trust God from the bottom of my heart though, I have to GET to the bottom of my heart. Just like getting to the bottom of a pop bottle requires pouring out the pop inside of it, getting to the bottom of my heart requires pouring out the top layers first. The dam burst, and I purged my thoughts and fears and feelings to the Lord…and without restraint, I shared so deeply with Him all the darkness and tangled thoughts within me that I’m privy to, and the things I Iong for for the ones I love so much. How deeply did the tender Spirit of God dig within me….to free me….and connect with me…. After extended time where He just was working, He took me into worship…Oh, how different worship is when I’m really connecting with Him in it. Phrases take on life and make me weep with thanks. Truths become things I can take hold of from a saved/whole place, instead of from a fearful place…A rock forms underneath my feet… Thank you Triune God…my Daddy in heaven, my brother and savior Jesus, and my precious Spirit of God who willingly lives with me and in me each day, agreeing to suffer what I suffer– in order to love and protect me, and get me safely through…..
As I read Graham’s newletter, I knew God had timed Graham’s words with what He’d just done in me…so that I could “get it”. So that I could get that He HAD heard my plea to Him earlier in the day….and that He’d brought me exactly into the place of CONNECTEDNESS and intimacy with Him that I’d only just begun asking for him to refresh. Oh God, you are my God; I earnestly search for you. My soul thirsts for you; my whole body longs for you in this parched and weary land where there is no water. P.S. Some great worship for such a time as this: All I have by Charlie Hines, Lay It Down by Matt Maher, Amazing Grace by Chris Tomlin, Hallelujah by Bethany Dillon, and Unwavering also by Matt Maher. Actually, Michael G.’s teaching at Central Vineyard this week inspired me. He shared about how getting into intimacy with God is much like tending a garden. If you haven’t done it in a while, it’ll probably take a bit of work to get it to a place where it’s going pretty well. I can really relate to that, and it got me started thinking about how it was time to get back into my garden. It inspired me. I don’t really enjoy gardening, and never did it before last year. If you ask me why I garden, I’d have to say that I think I was “called” to garden last year. 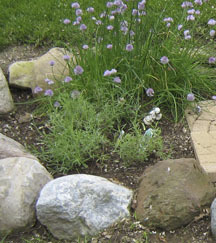 It was very healing for me to clear the ground, develop a plot design, pick my herbs, plant them, and tend them. I felt God took me to gardening almost for therapeutic reasons…to give my mind a chance to rest from the heavy duty life that had been going on in the prior year or two. I found that as I worked among my herbs, I’d have these thoughts that would occur, about how similar gardening was to living life with the Lord…. I need to take care of the soil first…. the plants first… the things that really matter, before I take care of the decorative touches I have around my garden. Do what matters first. I tend to want it all done fast… and all at once…. then I peter out. I need to learn constancy and patience. Herb gardening and time with the Lord…. both have an extra special quality in the mornings. My herbs scent the air so strongly in the warm, humid start of the day… God’s aroma therapy. Morning time with the Lord often sometimes seems the most full of His present help too. Sometimes, despite my best efforts, a surprising blight can come along and destroy something that just previously had been doing fine….a life lesson that I’ve lived again and again… this is when your commitment level is tested… you and your garden find out how committed you are… and if you’ll just be a gardener…… or a Gardener. If I keep at it, it will be lots of work, but it will be easier, more enjoyable work. If I grow too busy or distracted, the weeds start up pretty fast…THEN it’s even HARDER to get it all in working order again. No matter how long it’s been, or how bad it looks, or how tall the weeds are, or how poisonous the weeds have become…it’s always possible to reclaim the land…and start a garden. And with HELP alongside me, what was daunting, starts to be doable….